Riding the Toy Train of Darjeeling Himalayan Railways (DHR) has always remained a coveted experience to the tourists. Only few would let go such an opportunity. And there is a clear reason why so. After all this Toy Train has been accorded the UNESCO World Heritage status, and that's for a special reason. Operating on narrow gauge tracks since 1880s and providing an important transport link to various parts of Darjeeling hills and lower plains, the toy train is an icon of our heritage since the colonial days and an engineering marvel that was achieved in that era. It also offers a wonderful way of absorbing the Himalayan beauty as you traverse along the slopes of the hills. Where else can you find a small steam engine pulling mini coaches up the steep mountains through breathtaking landscapes and overcoming almost impossible curves and gradients using sheer engineering ingenuity and creative skills. The snail pace at which the train moves through the hilly terrain is at times so slow that you can often see the local school children hopping on and off the train on the move. Although the diesel engines used these days are faster and more powerful, the original steam engines still operate in some sections and also for joyrides. The steam loco drawn trains sometimes tend to skid in steep gradients. You can often see an attendant standing in front of the engine and sprinkling sand on the track to overcome such difficulties, particularly in monsoon time. Won't you like to experience a ride on such heritage transport that once provided the first and the most important mountain transportation link in the country? And the one that offers a unique ride with picturesque mountain views. You will pass by villages and local shops on the way with children on the street waving at you as you take this relaxed and charming journey through the hills. Check out DHR Toy Train Story to know why DHR Toy Train received the World Heritage status and remains close to the heart of many Indians. You can enjoy the toy train rides in several ways. There are joy ride tours as well as regular transport services on toy trains. If you want to enjoy discounts in Darjeeling, look into Darjeeling Tourism Card which would entitle you to get great discounts with several tour operators, transporters and even in many restaurants, hotels and shops. Toy train joy rides operate from Darjeeling Railway Station. It's a 2-hour round trip from Darjeeling up to Ghum and back covering a total distance of 14kms. There are several such round trips during the day starting in the morning. Number of rides per day depends on the demand during the month or the season. The train stops for 10 minutes at the Batasia Loop. At Batasia the train makes a loop around a wonderful manicured garden. The view of Darjeeling town and the snow peaks of Kanchenjunga from here are unparalleled. The War Memorial built in honor of the Gorkha soldiers who sacrificed their lives is located at the center of the Garden. Ghum is the highest altitude station on the Darjeeling Himalayan Rail track. Altitude of Ghum is 2225.7 meters (7407 ft). Here the toy train stops for 30 minutes for a visit to Darjeeling Himalayan Railway museum. The DHR Museum is located at the station premises. The highlight here is the oldest toy train engine - The Baby Sivok. The entree fee to the museum is included in the ticket price. DHR sends by post a certificate validating your ride on the toy train so that you can cherish the memories of your ride. Update: The certificate is no longer issued since several years. Currently 18 rides are scheduled from the morning (starting at 7:40am) till afternoon (the last train being at 4:20pm). So there are ample opportunities to choose your time based on your convenience and plan for the day. The timings and number of rides do change depending on seasonal demands. And what more... depending on your preference, you can avail either a steam engine hauled toy train or one with a diesel engine. The steam engine train of course offers the authentic experience of the heritage and the colonial aura when such toy trains where first created. But such rides are quite costlier too compared to diesel engine rides. There are usually two first class coaches provided in a steam engine train, while three first class coaches in diesel engine joyride toy train. TIP: Note that during high season, there is a lot of rush for the rides and you should try to book well in advance. Don't plan to buy the joyride tickets after you reach Darjeeling because you may not get them. Just in case you don't get the joyride tickets, an alternative plan is to buy a ticket on the regular morning toy train operating between Darjeeling and Kurseong, which too goes via Batasia and Ghum. Get off at Ghum and take a shared jeep back to Darjeeling... almost similar experience as the joy ride. However this is a diesel engine hauled train and not steam engine. You can buy tickets online through Indian railway site irctc.co.in . Diesel Engine Rides: Rs. 805/-. All first class seats. Steam Engine Rides: Rs. 1,405/-. All first class seats. 1) Above are round trip fares Darjeeling-Ghum-Darjeeling. 2) No concession in Darjeeling Toy Train Joy Rides to Children of age 5 or above, neither to senior citizens. No tickets required for children below 5 years. 3) The fares of Steam Engine pulled trains are higher because they represent the original heritage trains and their maintenance cost is also higher. Fares include admission to the DHR Ghum Museum. 4) A First Class coach has individual reclining seats and can accommodate up to 17 persons. The toy train in Darjeeling is like any other normal train and the process of booking seats is similar. You can book the joyride either online though the Indian Railway's website or at any computerized reservation counters. Visit How to book Toy Train Joyrides in Darjeeling to know about all the details of booking a joyride (both online and offline at the counters). This round trip toy train safari (3 hours) operates between Siliguri Junction and Rangtong Station. Rangtong is a small village on the roadside and at an altitude of 1404 ft. It's 16kms from Siliguri Junction. The train usually leaves at 10:30am from Siliguri Junction, goes past Sukna, and reaches Rangtong at 11:50am. It halts there for 20 minutes and returns to Siliguri Junction at 1:35pm. The total round trip distance is 32kms and takes about 3 hours. The Jungle Safari takes you through the Mahananda Wildlife Sanctuary located around Sukna and Rangtong station, and offers breathtaking view of the valley from Tindharia. This safari is a great treat for the nature lovers. There are two or three coaches provided depending on the demand. The Toy Train is pulled by a 'B' class steam locomotive engine. NOTE: Earlier the Jungle Safari used to go up to Tindharia / Gayabari and return making it a round trip of about 6 hours. Now it has been reduced to a round trip of only about 3 hours. Update December 2018: For the first time a steam engine hauled evening train has been introduced for Jungle Safari to Rangtong which leaves Siliguri Junction at 3pm. The train has one general coach (with a capacity of 17) and a dining coach (with a capacity of 12). So you can now enjoy the jungle in the evening and have refreshments as well. The ride costs Rs. 1000 while with food Rs. 1,200/-. Visit How to book Toy Train Joyrides in Darjeeling to know how you can book the jungle safari. 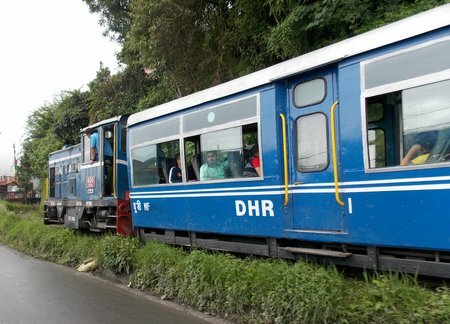 There are diesel engine hauled toy train services that provide regular transport connections within Darjeeling district. One of the most popular ones for tourists is the service between New Jalpaiguri (NJP) station and Darjeeling which passes through picturesque mountain landscapes and villages. The track often runs side by side the main motor road (The National Highway-55 which is popularly known as Hill Cart Road) and even crisscrosses the road several times. There are breathtaking zigzags and loops along the way to help the train negotiate steep gradients. The train (no. 52541) usually runs daily during high season. It leaves NJP at 8:30am and reaches Darjeeling at 3:35pm. Total distance is 88kms. The return train (no. 52540) departs Darjeeling at 8am and reaches NJP at 3:10pm (Tuesday, Thursday, Saturday). It takes little over 7 hours to complete the one-way journey as per schedule, although it's quite usual that the train runs late. Between NJP and Darjeeling, the train stops at Siliguri Junction (but no longer at Siliguri Town), Sukna, Rangtong, Tindharia, Gayabari, Mahanadi, Kurseong, Tung, Sonada, Ghum. The train is hauled by a Diesel engine. It usually has two first class coaches and a luggage van to store luggage. During high season, additional coaches may get added. No food is served on the train and you won't find any food vendors along the way. So carry water and food. Most coaches do not have toilet facilities while few do. The intermediate stations along the way too do not have toilet facilities. So what is your option to relieve yourself in case your coach doesn't have a toilet? Well there is none practically. I did see a person literally running to the adjacent coach when the train stopped at Kurseong. The adjacent coach luckily had a toilet and he could manage to get back in time... with a painful smile though. The train stops only for about 10 minutes in Kurseong. It barely stops for a minute or two at the other stations where this option wont work either. If you want to know about the complete route of Darjeeling Toy Train, all the stations where it stops, it's arrival and departure time at each such station, then Visit Darjeeling Toy Train Route & Journey. Update April 2018: Two air-conditioned coaches have been built (actually upgraded from earlier first class coaches) and attached to the Toy Train running between NJP and Darjeeling (both for up and down journeys). Each AC coach has large glass windows for viewing and capacity of 15 persons. The train (no. 52545) leaves Kurseong at 3pm reaching Darjeeling at 5:50pm. Total distance is 31kms. The down train (no. 52544) departs Darjeeling at 10:15am reaching Kurseong at 13:10pm. It is usually hauled by a Diesel Engine having 2 or 3 coaches (number & combination of first and second class coaches vary). There is also a daily school train that runs between Kurseong and Darjeeling. This diesel engine hauled train starts from Kurseong at 6:30am in the morning (no. 52587) and reaches Darjeeling at 9:05am. The train returns from Darjeeling at 4pm (no. 52588) reaching Kurseong at 6:30pm in the evening. A steam engine hauled toy train known as Red Panda operates on Tuesdays, Thursdays and Saturdays between Darjeeling and Kurseong. It has two first class coaches. The train 52570 starts from Darjeeling at 9:15am and reaches Kurseong at 12:30pm. The return train 52571 departs Kurseong at 2pm and reaches Darjeeling at 5:45pm. Distance covered is 31kms and there is no stoppage in between. NOTE: Do not plan to board with heavy luggage on the toy train which originates from Kurseong. They do not have luggage vans. Luggage space in the normal coaches are limited to overhead racks and below the seats. NOTE: First Class toy train coaches have individual reclining seats like standard chair cars. The seats in Second Class coaches are joined and non-reclining. Second class coaches accommodate more passengers than First Class coaches. Darjeeling to Ghum: First Class - Rs.410, Second Class - Rs. 30. Darjeeling to Sonada: First Class - Rs.535, Second Class - Rs. 45. Darjeeling to Tung: First Class - Rs.555, Second Class - Rs. 45. Darjeeling to Kurseong: First Class - Rs. 680, Second Class - Rs. 60. NOTE: Second Class is available in limited regular trains, while First Class is available in all trains. Visit How to book Regular Toy Train rides in Darjeeling to know how you can book a seat. How about chartering a DHR Toy Train with the steam engine hooting it's way through the mountains and lovely landscape as you enjoy the ride with your family and friends in complete exclusivity!! It's possible and that too at an attractive rate. You can also book it to celebrate a birthday party or hold a private function. In fact you can also have flexible timings of your choice. Check out Chartering DHR Toy Trains. 2) Check out Darjeeling Tours & Sightseeing for many other great tours and rides in Darjeeling. Hi, yes there is usually a luggage van in this train. There is no separate booking required for storing your luggage. It will be difficult to avail that at Siliguri Jn because the train stops there only for 5 minutes, but possible if you can manage the logistics through station master's office. Sir, I knew that both Joy toy train and Normal toy train would follow the same track from one of your many Posts. I just want to know whether the Normal Train, that is the train from NJP to DJ would take this Circular Loop (Batasia loop) or only the Joy toy train would cover that loop? Thanks in advance for your answer. Hello, NJP to Darjeeling toy train also takes the same route from Ghum onwards going along the Batasia loop. The only difference is, the joy ride train stops at Batasia loop for 10 minutes so that one can get off and enjoy the views around. The NJP Darjeeling train won't stop at Batasia. Hi Raj, Namaste. I will be visiting Darjeeling next month February. I would like to take the toy train journey. Can you recommend which is the nicest and more popular train journey. Thank you. Hi, steam engine hauled toy train joyride is more popular... a morning train would give you better chances of views from Batasia loop. Hi Raj, Can we have just one way ride to Ghoom through toy train and then go around the monastery and near by areas and return by another train or by a sharing vehicle. We are to visit during new year. Hi, you can get off at Ghum but can not board another toy train with the same tickets. Once you visit the monastery, you can walk back to the taxi stand and take a shared Jeep back to Darjeeling lower town (Chowk Bazaar). Namaskar, I will be in India in February 2019. Is the toy train between NEW JALPAIGURI DARJEELING operating in February 2019. Await your response so I can plan my tour. Thank you very much - Dhanyawad. Hello Gary, the toy train between NJP and Darjeeling is presently operational and unless for any unforeseen circumstances, it should continue to operate in February as well. You can check availability in Indian Railways website (irctc.co.in). Regards. Please can you confirm whether the DHR is running at the moment? I have bought a ticket from New Jalpiguri to Darjeeling in November but some websites say that the service is suspended due to a landslide? NJP to Darjeeling train is currently suspended although DHR is operational between Kurseong and Darjeeling as well as for the Joy Ride (Darjeeling - Ghum - Darjeeling). Administration is working on clearing out the debris which is expected to be done in the next few days. A major festival time (Durga Puja) starts from October 15 when tourist arrivals would surge and they are targeting to complete the work by then. So I think in November there should not be an issue. Dear Raj, I'm planning to visit Darjeeling in Dec 2018. Your blogs are excellent. I found Joy Rides are very costly & sometimes canceled. So, I booked DJ KGN NJ Train (52588) from DJ (4pm) to Ghum (4.30pm) at Rs. 30 only. In the evening time, how to go back from Ghum Station to Darjeeling Mall? Is there any shared vehicle available at evening time? What would be the cost? Ghum to Darjeeling road route is quite busy... you might get a shared jeep around that time. Otherwise private taxi would be the other option (which too would be far more economical compared to joy ride fare). Shared jeep would take you up to Chowk Bazaar (lower town) and then you need to walk up to the Mall. Dear Sir, Thanks for providing great information. I am planning to visit Darjeeling in first week of October'18. I have read lot of information and reviews. I was about to book tickets for joy ride (2 hours) . However, after reading reviews I'm confused. Most people are saying the route is not good. There are lot of shops & so on. Now, I am confused between Darjeeling to Ghum and from Kurseong to Darjeeling. Please Help. Kurseong to Darjeeling train will also go through Ghum station and then take the same last stretch up to Darjeeling. There are shops close to the track when the train passes through townships, and there are several scenic stretches as well. Kurseong to Darjeeling would have more number of scenic stretches and also more number of townships along the way. Hello, I want to go Darjeeling from Shilliguri and stop at Ghum. From Ghum via toy train reach Darjeeling. My question... is there availability of toy train from Ghum to Darjeeling? You can book one that comes from Kurseong or NJP (check the timings) and board at Ghum. I am travelling from NJP to DJ with my family. I have already booked toy train tickets from NJP to DJ (Train No. : 52541). Just wanted to know whether the Joy Ride from DJ to Ghum (the 2 hours one) is the one I should go for? And, do these basically cover the same places? Could you compare the two journeys? The route from Ghum to Darjeeling (about 7kms) is the same for both the journeys including Batasia Loop. The only difference is... the train on joyride stops at Batasia for 10 minutes allowing passengers to enjoy the views and also at Ghum station for 30 minutes for visiting the Darjeeling Himalayan Railway Museum. Additionally in Joyride you have a choice of riding a steam or diesel engine hauled train while the one from NJP is always diesel engine hauled. The ticket cost for joyride is too expensive, the journey is not that worth. The train passes through crowded markets and you will hardly enjoy the view of the valley or the mountains. its construction everywhere and not even an inch of space is left for enjoying the view from the train. If you want to see the train you can go to Darjeeling station or Batasia or Ghoom and take a closer look at the steam engine. Overall Darjeeling is a crowded over exploited tourist place which is already saturated. This is a classic example of what mindless tourism development can do to a place. In order to reach Darjeeling station for joyride how to reach there from club side. Are there any shared jeeps available? Shared jeeps are occasional at Clubside (i.e. below Planters Club). You can easily walk down to the station (15-20 minute downhill walk, less than a kilometer). What station do you pick the toy train up in Siliguri? Many thanks. Hi, in Siliguri the station is Siliguri Junction. The starting station is the one prior - NJP (New Jalpaiguri). Hi, I read so many of your articles and they are so informative. It's like Encyclopedia of Darjeeling. Seriously I mean it. I wanted to know about Darjeeling Himalayan toy train. We are planning in last week of February 2018 and our hotel is Sterling Ghoom. Can we go from Ghoom to Darjeeling ? Or Darjeeling to Ghoom only .. which one do you suggest ? Or is it mandatory to go from Darjeeling to Ghoom and return to Darjeeling? Hi, currently you can board the toy train Joyride from Darjeeling for a 2-hour return journey although you can get off at Ghum if you want (but you pay for entire return trip). For Ghum to Darjeeling one way journey you can avail one of the two other passenger toy trains... one coming from NJP and the other from Kurseong. The route from Ghum is the same as joyride. I am Sanjida khan from burdwan west Bengal.. Want to go Darjeeling on 29th December 2017. Please inform me does the toy train run between NJP To Darjeeling ? Can I book ticket from irctc website ? But I searched for the train running status 52541 ...then it shows train canceled... Please help me ..thank you. You need to keep checking the irctc website. Currently it shows cancelled because there is not enough tourist demand. Hello, we will travel to Darjeeling in October. As we fly to Siliguri and want to take the Toy Train to Darjeeling, we are wondering if we need a ticket for the train in advance, or if we can book it in Siliguri. We arrive Friday, 13th October, and want to take the train Monday, 16th October (therefore we have some days to organise permits and tickets). Thank you very much for your help, kind regards. Hi, toy train is not operating currently due to unrest in Darjeeling. You can check in irctc (railway) site few days before your departure and book if available. Hi, the toy train schedule changes frequently. Currently it's not operational due to political unrest in Darjeeling. Although irctc website might show available seats for future dates, the status might be updated later. So do check the status and weekly schedule few days before your planned arrival. Hi, I am Dr. Roy. Can you please guide me about the permissible baggage allowance for Toy train from NJP to Darjeeling as i am planning to travel this month end with 5 family members. Am in Pune and your guidance will help me plan my vacation. Regards. Hi, NJP to Darjeeling toy train has a luggage van (coach) attached. There is no luggage allowance as such (like any other trains). Heavy luggage has to be kept in the luggage van and not in the passenger coach. 1. Is the Toy Train between NJP and Darjeeling operational? IRCTC is showing that tickets are available but some websites report that Toy Train between NJP and Darjeeling is not Operational. 2. Will I lose my money if I book the tickets through IRCTC and later I see that there is not train from NJP to Darjeeling? 3. Fare for Toy Train between NJP and Darjeeling is INR 1300 per person. Is the journey worth paying 1300 for 7 hours ride? Many people has mentioned that the Journey is not worth the money. It's dirty and boring. Please advice. Thanks in advance. You should go by IRCTC website to know if the train is running for a day and book it. Like any other train, if it gets cancelled, the cancellation policy will apply and you can claim refunds. Enjoying the 7-hour ride is quite subjective and depends on the individual concerned. Many like to trace the entire historic narrow gauge DHR route to go through all stations, loops and zig-zags ... for them the journey has a different meaning compared to those who are looking only for enjoyment and views. If you belong to the second category, you can instead consider the 2-hour joyride from Darjeeling. Also note... toy trains have no toilets in most coaches... for some it can cause discomfort. If you do plan to take the full ride, you can also consider taking the train from Siliguri (i.e. Siliguri Junction) ... you can avoid the train journey through the traffic congested plains. I am planning to visit Darjeeling and return to NJP by toy train. Will it cover steam ride and forest ride? Darjeeling to NJP is a diesel engine hauled train.... you will pass through the forested area near the plains. Dear Mr. Raj, You have a wonderful forum. I have a question about taking the train to Darjeeling. My parents are visiting Darjeeling and arrive at Bagdogra on 30th April at around noon. I would like to book them on the train to Darjeeling but noticed that there is only one departure at 8:30am. Is there a possibility to join the same train at another station by catching up with a taxi, or is there a later train from Kurseong or some other station. Please advise. Thanks in advance for your help. First check if NJP - Darjeeling toy train is at all available on the day. They can try to catch the train from Kurseong, there are also other trains from Kurseong to Darjeeling. Check the train schedules from irctc website. But if they carry heavy luggage, then it can be a problem boarding the train from an intermediate station because only the one from NJP has a luggage van, and one can not keep heavy luggage in passenger coaches. Hello, I am planning a trip to India starting this coming June. I plan to travel from Calcutta to Darjeeling in mid-june, and I want to take the toy train. I know that I first have to get from Sealdah to NJP, but after this I am not so sure what to do. This is because whilst I also know that ordinarily I could get the toy train from NJP straight to Darjeeling - because of damaged tracks at Tindharia - I can only board the toy train from Kurseong. This is my problem - I cannot find how to get from NJP to Kurseong + I can also not actually find where I can book the toy train. Regarding the latter, I know the station codes etc - but when I search for them on train booking websites they do not appear! Please help! Much appreciated if you do!! Thank you. Hi, the track has been repaired quite sometime back. You can board the train from NJP or Siliguri, however it runs on few days of the week. You can book your seat from Indian railway site irctc.co.in . Hi Raj, I plan on boarding the Toy Train at Siliguri. Will there be enough room in the luggage van for my medium sized suitcase? Also, how long is this portion of the trip? Thanks so much. Hi, yes... medium size suitcase is okay. Will take nearly 6.5 hours to Darjeeling. Mirik route meets the main hill cart road at Ghum. This road runs parallel to the toy train track. So from Ghum onward up to Darjeeling (about 25 minutes drive) you will get similar views as toy train except that the toy train also traverses the wonderful & fascinating Batasia Loop which you can not really see from the road. But you can certainly get off the vehicle and enter the loop. Most tourists consider riding the heritage toy train an experience by itself, leave aside the views. Jungle Safari is usually a seasonal train. You can take the regular toy train from NJP to Darjeeling (it does not run everyday though). This train also goes through the same stations as Jungle Safari. You can go all the way to Darjeeling (about 7 hours) or get off at Kurseong and take a road transport, like a private or shared taxi. What you take first (taxi or toy train) will depend on toy train timings and the time when you reach NJP. One possibility is take a taxi up to Kurseong and then toy train. All toy trains from NJP pass through Kurseong plus there are toy trains that start from Kurseong for Darjeeling. So check your arrival time and toy train timings, and plan accordingly. Hi Raj, Thank you for the amazing details that you have taken the trouble of writing down for all of us. Just a quick question. My mother and her collugues are travelling to Darjeeling for a conference and have a Return flight from Bagdogra. I have recommended that they take the toy train upto Siliguri instead of a car, halt near NJP /Siliguri for the night and then proceed to the Bagdogra. I understand that the train stops at stations will compensate for not having bathroom on-board ? Correct? Thanks a ton! Hi, unfortunately the toy trains briefly stop at the intermediate stations and such stops can not be used for toilet breaks. In fact most stations along the route do not have toilets. So alternatively she can get off at Kurseong (half way), take a cab and go down to a hotel in Siliguri or Bagdogra. Hi Raj, Is it true that 52541 toy train from NJP to DJ doesn't have toilets?? I am planning for Darjeeling trip in September this year with my parents who are aged. I believe it will be a big problem if the train doesn't have toilets. What is the alternative if the doesn't have one? Most Darjeeling toy trains do not have toilets in the coaches. If that's a problem, go for a shorter ride (like the 2-hrs Joy Ride from Darjeeling, alternatively 3-hrs one way ride from Kurseong to Darjeeling or the reverse). Hi Raj, thank you for uploading all the relevant stuff regarding the travel to Darjeeling. It's because of this I am able to understand and make an itinerary for my family to make a visit to Darjeeling. I am planning to come down to New Jalpaiguri (NJP) in the month of September. My train (Dibrugarh Rajdhani Exp) reaches NJP at around 10:45 AM. I want to take the RED PANDA train from kurseong to Darjeeling which leaves at 02:00 PM from Kurseong. I have like a 3 hour window, will it be sufficient for me to make it on time? Thanks. If your train reaches on time, you can easily reach Kurseong by taxi before Red Panda leaves. It takes about 1 hour 45 minutes to reach Kurseong from NJP. Sir, I along with my 8 family members are schedule to visit Kurseong. And then we will move to Darjeeling. I get to know that Toy train is running from Kurseong to Darjeeling. Also joyride is there in Darjeeling. Joy ride is costlier than toy train ride. So, what are the main differences between these rides, whether the train appearance is different? Or we will get the different experience in joy ride? Main motto of our journey will be surrounding nature. But, if we got some special experience in joyride train, then I can go for its booking. Thank you sir. Kurseong to Darjeeling train is a regular commuter train pulled by diesel engine and mostly availed by the locals. It makes several stops at the stations in between. However goes along the same track as the joy ride from Ghum onwards. So you will pass by the same places. The Joy Ride is meant for tourists, has only first class coaches and all services (except the first one in the morning) are hauled by original steam engines. It stops at Batasia for views and also at Ghum station for visit to the DHR museum (entry included in ticket price). Hello Raj, Thank you for your valuable information. Please can you let me know what is the best time of the day to take the train. I know it would be dependent on lots of variable factors like weather, etc but assuming ideal conditions, what would be the best time to take the 2 hr joy ride? We will be there in the first or second week of May 2016. On the railways website I see steam or diesel options. The earliest steam engine option is at 10:40am. There is another steam engine journey in the evening. The one that starts at 8am is the diesel engine. Thank you. The earliest train is usually best for the views. If steam engine is a must do for you, then the one at 10:40am should be the choice. Hi Raj, I am planning to come to Darjelling in last week of April. My toy train tickets are already booked from NJP to Darjeeling. I would like to know that "Toy Train Joyride - Darjeeling to Ghum & Back " is a worthy trip? As we are already travelling on this route from NJP to DJ. Since you are already taking the regular toy train, you need not take the joy ride again as you will also go by the places which the joy ride covers. Hi Raj, If I take the Darjeeling Mail 12343 from Kolkata to NJP which arrives at New Jalpaiguri by 8:00 am, is it practically possible to catch the Darjeeling Toy Train #52541 that leaves NJP to Darjeeling by 8:30am ? Also do we get enough luggage space in the Toy Train for a comfortable journey that lasts 7.5 hours. If your response is encouraging I prefer to take this option rather than a taxi from NJP to Darjeeling. Really appreciate your time and expert advice. Best regards. Usually a luggage van is attached to the toy train between NJP and Darjeeling, so luggage won't be an issue. The time could be short unless Darjeeling Mail reaches on or before time, and all of you have able legs to walk fast or even run. Dear Raj, Not seen a better travel website than yours. Simple, Easy to read, very informative. Can't stop from asking the below query. I am traveling with my parents around end of March. After taking the jungle safari from Siliguri, will it be possible to cover Mirik site seeing and then go to Darjeeling. If so, what is the latest time by which one should leave Mirik for Darjeeling. During Jungle Safari, get off at Sukna on your return instead of going all the way back to Siliguri Junction. You will pass by Sukna anyway on your way to Mirik. Leave Mirik by 3:30pm if you like to travel in daylight and spend a few minutes at Simana. Greetings Mr. Bhattacharya! I have read almost every word of your website in preparation for a trip to West Bengal and, specifically, Darjeeling district; and I have found it to be incredibly helpful. Thank you for this labor of love. We are being asked to provide scanned and e-mailed copies of our passports to a tour operator (Nature Beyond) we have engaged in order to secure room reservations at Jaldapara Tourist Lodge and toy train tickets from Kurseong to Darjeeling (among other services). Please forgive us, but his is our first trip to India, and we are wondering if this is usual practice as we are somewhat concerned given we have never been asked to provide this information to tour operators in other countries. Many thanks for any guidance you can provide. Sincerely. Good day, while booking toy train tickets across the counter, a valid photo Id (photocopy of passport for foreigners) is required. This is however not a requirement for hotel booking. Some government hotels may ask for photo id number (like driving license number) at the time of booking, but not the private hotels. At the time of check in, it is mandatory to show your photo Id though (like passport) at all hotels in India. For Toy Train booking, the easiest is to book online through irctc.co.in website (Indian Railways). While registering for a user account, it will however ask for an Indian mobile phone number where confirmation and other SMSs would be sent. That is the only problem for foreigners. Tour operators can also do your online train booking through their own irctc registered account. Not sure why they are not doing it for your toy train booking in this case and instead proposing to do it manually across the counter and asking for passport copy. You can get into a dialogue with them on this. Carry food if you need. No food or water is served on the train. Neither there are any toilets in most Toy Train coaches. Hello Raj, in March 2016 we would like ride Toy Train to Darjeeling. What is the better railway station for tourists Siliguri or New Jalpaiguri ? New Jalpaiguri is a very big junction and perhaps it's not so easy to find the right train, but the train starts in the morning and we have a lot of time. What station would you prefer ? Many thanks for your help. Best wishes and warm regards from Germany. Hi, I personally prefer the station Siliguri Junction to board the toy train for Darjeeling. The main reason being the train comes from NJP and waits here for 35 minutes (from 8.55am to 9:30am). You can avoid wasting time if you board from Siliguri (note the station is Siliguri Junction and not Siliguri Town, they are 3kms apart). This part of the ride (i.e. on the lower plains of Siliguri) is not very interesting either. However if you have reached NJP by train and want to connect to the Toy Train, then NJP would be a convenient option. Hi, wait-listed passengers can not board the train. There is no unreserved compartment, all seats are allocated. Hello Raj, Your website is fantastic and so full of very useful information. Thank you. We are visiting your beautiful corner of the world in mid-October, from UK. Of course we want to travel on the toy train. Is it possible to get on it in Siliguri? have heard that there has been a landslide and a section of the line is closed. Is this true? If it is closed, where is the first station that we can get on the train after Siliguri? Many many thanks for your help. Hi, NJP-Darjeeling toy train re-started in June but had to be suspended again due to further damages to the track in monsoon. However it's operational between Kurseong and Darjeeling (daily two services). You can either board from Kurseong, or take a 2-hour joy ride from Darjeeling. Raj, Thanks a million times for your really helpful response. I think what we will do is get to Darjeeling by bus / taxi from Bagdogra when we arrive, and then leave Darjeeling by train to Kurseong, picking up a taxi / bus in Kurseong to get us to Bagdogra for our flight home, at the end of our holiday. Thanks so much for your help. Hi Raj, I looked at your site, and I found all the information very helpful. Thanks for providing those. I have one doubt... I am planning to take the Jungle Safari 10am train from Siliguri Jn and get down at Tindharia(12.20pm) or Gayabari(12.43 Pm). Is is possible to get down at Tindharia or Gayabari, if it's possible please suggest which is the best place to get down, since I plan to reach Kurseong from there, but I am not sure whether I can reach Kurseong from Tindharia or Gayabari through any means like Jeep or bus. And from Kurseong, I am planning to catch 3.00pm toy train and reach Darjeeling. Could you please let me know is this possible and if so will I be missing any scenery or important things that I shouldn't be when the train goes back to siliguri. I will be booking the Jungle Safari tickets for full length but if it's possible I will get down and move to Darjeeling via Kurseong. Hi, you can not go beyond Gayabari towards Kurseong by road as the road is damaged since 2010. You need to return to Sukna and take a taxi to reach Kurseong via Rohini. IRCTC takes time to incorporate into their database. However the NJP-Darjeeling train has been suspended temporarily because of rains and some large boulders falling on the track. Dear Raj, I hav gone through ur website and have found it very informative and helpful. Still I have got few queries for my plan. It would be very kind if u could clarify them to me. 1) instead of taking the 2hr joyride trip from darjeeling to ghum I opt for darjeeling to kurseong regular morning train will it halt at batasia loop and ghum for sigh viewing as in case of joy ride train. 2) I am planing of having the jungle safari trip as well. Can u help me plan it so that I can have a halt at batasia loop, ghum and den go forward and enjoy the ride. Hi, regular toy trains don't stop at Batasia, but they stop at Ghum for couple of minutes. Jungle Safari train operates from Siliguri up to Gayabari and doesn't come up to Batasia or Ghum. Hi Raj, I was to travel by the 52547 Joyride at 4:05pm on 12th May, but the steep increase in fare has made me change my mind. Instead, I have booked First Class seats (Rs.140 per person) in the regular train service number 52588 departing Darjeeling at 4pm and reaching Ghum at 4:30pm. For returning from Ghum, I have booked the service 52545 departing Ghum at 5:08pm and reaching Darjeeling at 5:50pm. The downside of taking this option will be that there will be no 10 minute halt at Batasia loop and the engine will be diesel rather than steam. However, the saving will be substantial without much decrease in comfort and enjoyment, as I assume that the First Class coaches in the regular train will be the same as that in the Joyride. What do you think of this change in plan? I have not yet cancelled my Joyride tickets and waiting for your advice. Dear Raj, How are you? I am from Kolkata and would be reaching Darjeeling on 12th of April. We have booked the joy ride vide irctc but unfortunately we have got the 4 O'clock slot. There was no morning slot available at the time of booking. How is this time for the ride? I have read in the blog that you prefer morning ride but will this slot be worthwhile considering the fact that the sun would go down in sometime. Can we expect some visibility or should we consider it bad luck and let go off the ride and do something else. Need your suggestion. Hi, Suggest you go ahead with the ride and hope to get good views. In the morning you get bright lights and usually great view of Kanchenjunga snow peaks from Batasia loop.... ideal for photo shoots. The last train (at 4.05pm) will reach Batasia around 4:45pm. There will still be daylights for taking pictures. But in the afternoon, the peaks are not always visible as they get covered with cloud. But you may be lucky. However the flowering gardens of Batasia and the scenes on your journey will be equally enjoyable. Dear Mr. Raj, During the last week I have read your website with great interest and resultant appreciation. The only inference one can draw is that such a website can be created only out of passion. I will also be subscribing to the tourism card once my train booking formalities are completed. I am planning to visit Darjeeling probably in the first week of May. We are a family of four (3 Adults & 1 Child). Right now I am focused only on my reservations and I will get back to you on subsequent questions later. 52546 - Ghum - FC - 9.20 AM. - One more Toy-train i.e. Train No. 52585 from Kurseong at 7.00 AM is there. 2. We would prefer to travel by a Steam Engine train. Out of the above four which is a Steam Engine train? 3. Is Train No. 52546 from Ghum the train that offers joy ride. Is the Ist Class ticket for this train above Rs. 1,000/-? How does this train offer greater joy as compared to other 3 trains? 4. Which train would you recommend we should take? 5. Would enjoying the views be better in the morning 7 AM train or afternoon 3 PM train? I would highly appreciate your response and thank you very much for having spared time for reading this long mail. Good day, There is no toy train yet from NJP. Although there is a commuter train between Kurseong and Darjeeling which makes two round trips in a day, the best option for tourists is to take a 2-hour round trip joyride from Darjeeling. 4 round trips are offered, two in the first half and two in the afternoon. The first one (at 8am) is a diesel engine hauled toy train while the others are steam engine pulled. A morning train is usually better for views. I booked online in January for 1st April for Rs.400/-. Now the fare has shot up to Rs.1,090/-. Will we have to pay the difference? This is very upsetting. Yes, you need to pay the difference when you board the train. This is an unexpected fare hike by DHR & Indian railways. There is a lot of furor going over it. They had already revised it from initially announced fare of Rs. 1,165 to 1,090. However the diesel engine pulled toy train joyride fare is 625/- (it starts at 8am). You may also consider another option ... take the regular commuter toy train that starts from Darjeeling at 10:15am, buy ticket up to Ghum (Rs. 140/- in first class, Rs. 30 in second class). It's a diesel engine hauled train and goes up to Kurseong. You will get off at Ghum and get back by a road transport like a jeep. Similar route and experience as the joyride. If you get the tickets, you can cancel the earlier ones. You can buy this online as well. But it's entirely up to you what you may like to do under the circumstances. 1. How early should we book the tickets (for 20 people)? 2. Should we book online or ask our tour operator to book? 3. What will be the cost per ticket? will it change in April 2015? Hi, while all your questions should be directed to Indian Railway Inquiry, I'll try to answer some of them. Book online and well in advance. April is in high season. You can book up to 60 days in advance. Since you are a large group, book as soon as your date gets into reservation period. Current fare is Rs. 400/- per person. Will fare change in future?? Only a railway authority can answer that question, but I doubt even if they would respond to such query. Having said that, your time of visit is in the beginning of next financial year and that's the time when railway budgets are revised. So from that perspective there is a possibility of fare change. However having steeply revised it for Darjeeling toy train this year, it's unlikely that there will be any significant changes next year. Good luck! Hi Raj, Me and my wife are coming Darjeeling on 9th of Nov'14, and will stay there till 14th Nov'14. We want to take a ride of toy train and planning to take it while we will be coming back. I checked the fare for Darjeeling-Ghum-Darjeeling (400/- Rs), and Darjeeling-Kurseong (210/-Rs) for first class ticket. Can you please tell me the possible reason of higher fare for joy ride?? Will I miss something if I book tickets for Darjeeling-Kerseong??? Hi, Darjeeling Kurseong toy train is a regular commuters' train and diesel engine hauled, while the joy ride is original steam engine hauled train mainly targeted for tourists who want to experience the old heritage and ride. The joy ride also includes entry fee to Darjeeling Himalayan Railway Museum at Ghum where the train stops for sometime. So if you take Darjeeling Kurseong train, while you can enjoy the scenery including Batasia loop, you will miss the sights and sound of steams blowing out of the original engines designed by the British and also a visit to the DHR Museum. I have a query. Joyride covers only from Darjeeling to Ghum, whether other two trains (DJ KGN NG TRAIN) goes (one way though) going upto KURSEONG. So which will be better, Joyride (covering up to Ghum) or the later one which covers up to KURSEONG? What about the scenic beauty between KURSEONG to GHUM? I mean, will I miss something worth seeing partly if I choose Joyride instead of the later? Please Suggest. A great viewing area is Batasia Loop where you get sweeping views of Kanchenjunga range and Darjeeling town. This and the highest station Ghum are anyway covered in the round trip joy ride. Beyond Ghum, there are only two stations ... Sonada and Tung. While Sonada is quite crowded, but the Tung is a sleepy small village. Every time I pass by Tung and look at the tiny station shed, I imagine siting there some day... but never made it so far. Just before Tung you can see the lovely landscape of Margaret Hope Tea Estate and after Tung the Singell tea estate. You pass by forests of maple and chestnuts and then see the lovely views of Kurseong hills. However one way to Kurseong by toy train takes about 3 hours. So considering time involved, 2-hour round trip joy ride from Darjeeling satisfies most, but is it the same as a journey all the way to Kurseong? Well no, there is more to explore further down towards Kurseong. Thank you for a wonderful and informative site. My husband and I will be travelling to Darjeeling in the 1st week of September 2014. The Following are some of the queries which I could not find answers to. We would be grateful for your views regarding these issues. 1. Please let us know the difference between cabin and coupe in the toy train from Kurseong to Darjeeling? The IRCTC site is asking for option in berth as Lower/ Upper/ Cabin/ Coupe in FC. 2. What is the difference between 2S and FC? The cost of FC is significantly higher. Are there any additional features/services in keeping with the cost? Hi, Berth, Cabin/Coupe options are not applicable for DHR toy trains. They are meant for regular first class coaches in regular express/mail trains. They should have defined the Class type of first class coach as CC (Chair Car) instead of First Class which could have avoided the confusion. Darjeeling toy trains do not have sleeping berths, cabins or coupes. So ignore the berth/cabin option and keep it at "No Preference". The First Class coaches have individual push back seats like in Shatabdi and lot more space. While 2S (stands for Second Seating) is a second class coach with lot more seats. Several persons sit together on a wider cushioned seat. Is there any personal cabin for couples in the toy trains. Hello Raj, I am planning to visit darjeeling on 8th jan 2014. I will be going from NJP station availing any shared jeep/cars. I have booked 2 toy train tickets (Darjeeling-Kurseong) from irctc website in 2nd class. Just want to ask that if the journey in 2nd class would be comfortable or not in the sense will we be getting the seats or the local commuters would grab them first. Should I cancel them and make arrangements in 1st class. If you can highlight the difference between both the classes. From Kurseong station how much time it takes to reach NJP station and what would be the price like so that I get an estimate and not get cheated there. Thanks. Hi Mr Raj, I'll be travelling in the toy train when returning from Darjeeling upto Kurseong. I'll be travelling with my parents nd will have 1 trolley bag and 1 medium size bag. I heard that there is not enough space to keep luggage. So should I book 1 extra ticket to keep my luggage? Hi, Darjeeling Kurseong toy train is a commuters train and you should not carry big luggage. But between few of you, you can have one or two bags or small suit cases ... in India how big is big in such situations is never defined. So sometimes you can get away even with large suitcases. Considering minimum inconvenience to fellow passengers, use your own discretion. 1. Is the train running the entire route (8 hours or so)? 2. Would you recommend taking it? P.S. we are Americans living in Bangalore for 1 year. However both Kurseong - Darjeeling train or the joy ride will pass through Batasia Loop, a double spiral loop where the train negotiates an altitude of about 1000 ft as it completes the loop ... probably the most amazing part in the entire trip .... added to it is the wonderful view of Kanchenjunga snow peaks from Batasia. I would recommend the Joy Ride out of the two because the train has first class coaches, while the other one is a commuters train and runs only with second class coaches. Hi Raj Sir, Thanks a lot for your efforts for helping tourists. I have some queries. How many joyrides of toytrain run in Darjeeling? If there are 4, then can I book evening joyride? Which is from 16.00 to 18.00 hrs. Will there be sufficient daylight to enjoy this joyride and visit DHR museum? I am planing to visit Darjeeling on 07 Nov. 13. I am reaching NJP station by 06.00 am by Abadh Assam Exp. Is it ok to book afternoon joyride.(01.20pm). What is maximum time required to reach Darjeeling from NJP station by private car? Hi, Usually four toy train joyride trips run everyday during high season. Whether it'll be reduced in November is something you can find out from the Indian Railway site (irctc.co.in) as you book your ticket. In November it gets dark around 5:30pm. If you reach NJP at 6am, you can take the afternoon ride. It takes about 3.5 hours to reach Darjeeling from NJP provided there are no delays on the way. Hi Ranjan, There is no food in DHR (other than the Safari ride which takes place from NJP). The joyrides takes place in the monsoon season as well. You will often find a person standing in front of the engine sprinkling sand on the tracks. Due to the gradient the train often skids. The sand ensures that it moves on. What is the current status of this train. I will be in the area in October 2013. Is it likely that the train will be fully operational or only partly in service and if so, what portion will be operational. Your question can be best answered by Darjeeling Himalayan Railway (DHR). The track is lying damaged for the past 3 years. So hoping that it'll be repaired in the next 3 months looks rather unlikely. While funding has been the main issue, the terrain of the damaged track also makes it difficult to repair. The landslide has almost completely washed away the landmass and the track here virtually hangs in a deep gorge. Currently the section between Kurseong and Darjeeling is operational and likely to remain so through this year. Your website is very informative. One can plan his/her holiday with ease. Somebody misled me about the joyride train information but I came to know about its exact scenario from your site and booked my ticket for 14/06/2013. Thank you for your great work. You need to keep checking the railtourism site time to time. There is no other way to know. Usually they come out with the packages by now. Hi, There is no general class in the toy train that runs from Darjeeling for Ghum joy ride. It's all first class seats. Once you reach Darjeeling, you can ask a tour operator to see if they can help. Otherwise, you can take the regular toy train for Kurseong (starts around 10am). This is not a joyride, but all the same. Get off at Ghoom and return by shared jeep or taxi. You will have a similar experience. Not many know about this option, so you should get tickets. But this is a second class train... doesn't matter. It's nice. It doesn't matter which place you visit first, Darjeeling or Gangtok. Regarding the mountain railway, I note your comment to travellers that there is no space for large luggage on the train, we are on a round the world trip and a ride on the railway is an important part of the journey for my husband who is a railway enthusiast, is there anywhere to store luggage securely at NJP? 1) Come up to Kurseong by road (not the Hill Cart Road that runs side by side the toy train track. That road too is damaged at the same point. There is another alternative road used these days up to Kurseong). From there take the toy train up to Darjeeling. However you need to time it correctly with the departure time of the toy train, and also keep in mind that you can't carry heavy luggage in a toy train. 2) Take the two hour toy train joy ride from Darjeeling up to Ghoom and back. There are 4 such rides everyday during high season. Most prefer this option. But you should book your tickets well in advance. P.S: The sections above provide all the details of Toy Train services, schedules and how to book the tickets. There are only 4 tickets available in the toy train and we have 7 members. So is there any other option to take the ride? From Darjeeling, take the toy train to Kurseong, get off at Ghoom and come back by car/shared jeep. It leaves Darjeeling in the morning (around 10am). Similar experience. Hello, Luggage space in the passenger coaches of the toy train is very limited. If the train has a luggage van (which is usually a part of the second class coach), then carrying luggage won't be a problem. You will need to check the coach composition with Darjeeling Himalayan Railway. If there is no luggage van (which is quite likely for Darjeeling to Kurseong section), then don't plan to carry heavy luggage. Note that May is high tourist season and the trains are likely to be full. Hi Marcus, There is no toy train from New Jalpaiguri (NJP) up to Darjeeling these days.. A section of the track between NJP to Kurseong is damaged and has remained this way for the last couple of years. So I doubt it would be repaired before Christmas. Yes, you should reserve all joy rides in advance as there would be lots of tourists during that time. Hi Raj, Do you think there will be any problem getting a steam train journey from Kuresong to Darjeeling if we go to the station at Kurseong on the day of travel? Also do you just turn up on the day to take the joy ride from Darjeeling to Ghoom and back or should we try to book in advance? If we do, can you give me the name and e-mail details of a Darjeeling based travel agent who may be able to help. Thank you. A section of the toy train track between NJP and Kurseong was damaged in 2010 due to landslide. It has remained un-repaired until now apparently due to lack of funds. It's unlikely that it would be operational soon. However, if you want to take a joy ride, take the 2-hour toy train round trip ride from Darjeeling to Ghoom and back (operates twice daily). Try to book the ticket in advance. If you find it difficult to get the booking option online through IRCTC site, go to an online railway booking counter and inquire.